Artist and jewelry designer Mariana has been creating unique and original pieces of jewelry since 1997. 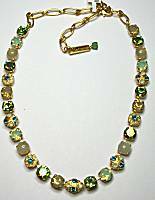 A lovely and aesthetically pleasing mix of old and new style, hand cut natural gemstones blend with fabric and crystal beads including Swarovski. Metal frames and chains are either gold or silver plated with tints to expand color range. Made in her home of Israel, Mariana explains "the love for my husband and my children fuels the endless energy I have to create my jewelry". Silver-plated nickel-free metal settings form earring that is 1/2 inch across with post in center back. Within the ornate scalloped edge is a center of sparkling clear crystal surrounded by icy gray faceted crystals or minerals. A nice piece for wedding accessories. Silver-plated nickel-free metal settings and chain, 5/16 inch wide and 7-1/4 or 8 inches long depending on which ring you clasp with. 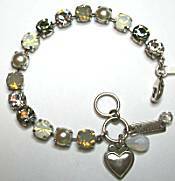 Lobster clasp, heart and crystal charm, signature tag. Simple prong-set crystals in black diamond, icy silver, opalescent milky white and fiery gray with champagne pearl. Lovely choice for wedding accessories. Silver-plated nickel-free metal settings form earring that is 2-1/4 inches long, 3/8 inch across, with leverback earwire attached at top. A graceful trail of crystals in translucent opalescent milk, silvery clear and black diamond colors include between them a cast metal flower with marcasite-like gray minerals around an antique pearl center. A faceted Labradorite stone makes a lovely finish. A nice piece for wedding accessories. Silver-plated nickel-free metal settings form earring that is 7/8 inches long, 1/2 inch across, with leverback earwire attached at top. A circle rich with rows of tiny elements has a cut marcasite-like gray mineral at center, antique pearls around that, then opalescent white crystals, before an outer ring of gray crystals or faceted minerals. A nice piece for wedding accessories. Silver-plated nickel-free metal settings and chain, necklace has design elements across 9 inches of front, joined along top edge to curve easily and gracefully. Center drops 1-7/8 inches, sides are 5/16 inch. Lobster clasp and back chain adjusts 14-20 inch length, signature tag. Simple prong-set crystals in black diamond, icy silver, opalescent milky white and fiery gray with champagne pearl extend beyond the central design. The center has leaf-shaped elements filled with gray minerals, opalescent milky crystals mix with clear, champagne pearls with fiery gray crystal, and drops that have an old world marcasite look. Lovely choice for wedding accessories. Silver-plated nickel-free metal settings form earring that is 2-3/8 inches long, 1/2 inch across, with attached leverback earwire. A round top with black diamond color crystal holds a larger dangle that combines shapes of crystals and glass pearl in colors of translucent milky opal, clear ice, opalescent and mineral gray. A final faceted Labradorite stone makes a lovely finish. A nice piece for wedding accessories. Matte rose-gold plated metal settings (may contain nickel) form petite earring that is 15/16 inches long, 5/16 inch across, with leverback earwire attached at top. Simple prong cup settings hold peach and champagne gold crystals that sparkle relentlessly in warm combination. Matte rose-gold plated metal settings and chain (might contain nickel), round elements span 10 inches of front, joined along top edge to curve easily and gracefully. Fancy double link chain on each side reaches to back. Lobster clasp and back chain adjusts 16-18 inch length, signature tag. 5/16 - 7/16 inch elements feature crystals in golden champagne, light peach, golden topaz colors. 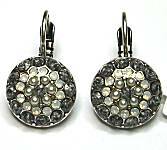 The larger round designs have small centers and even smaller crystals around them. Matte rose-gold plated metal settings (may contain nickel) form earring that is 1-3/8 inches long, 1/2 inch across, with leverback earwire attached at top. At top is fancy deep golden crystal surrounded by peachy smaller ones, an inverted teardrop of golden champagne crystal set in prong cup below. Yellow gold-plated nickel-free metal forms earring that is 1 inches long, 5/8 inch across, with leverback earwire attached at top. The fancy setting holds rows of small crystals in colors of opalescent seafoam, teal blue, and fiery cloud gray. 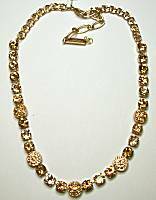 Yellow goldplated nickel-free metal settings and chain, color spans 7 inches of front. Fancy rope link chain on each side reaches to back. 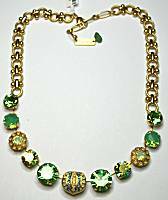 Lobster clasp and back chain adjusts 17-19 inch length, signature tag. Larger crystals 7/16 - 9/16 inch across are cut to sparkle wonderfully in colors of apple green, opalescent seafoam aqua, and fire polished blue-green. At center is a fancy setting with smaller crystals in opalescent seafoam, cloud, and teal blue. There are also a pair of flower designs with the same colors. Yellow gold-plated nickel-free metal forms earring that is 1-1/4 inches long, 1/4 inch across, with leverback earwire attached at top. Petite and elegantly sweet design features small crystals at top in colors of teal blue and opalescent seafoam, a small gold bead and briolette cut element (stone or crystal) in pale seafoam color dangle below. Yellow gold-plated nickel-free metal settings form earring that is 2-3/8 inches long, 1/2 inch across, with attached leverback earwire. A round top with fire polished blue-green color crystal holds a larger dangle that combines shapes of crystals in colors of opalescent seafoam aqua, pale ice green, teal blue and apple green. A final briolette stone or crystal in seafoam color finishes an elegant and dressy earring. Read about what others think of Mariana Spirit of Design jewelry! Instead of reviews for a specific product, this is a place to share about the designer line in general.